Do you still go to the banks to stand in one of those long queues just because you want to send money to someone or make an online payment? If you still do that it means you are still operating in the analogue while everything has been digitalized. Besides cash withdrawal via the ATM machine, I have no business going to the bank. I know most of you may have seen some online banking products but paid little or no attention to it. My advice is this, meet your bankers today and let them explain to you very well. But as for the folks that banks with diamond bank, I will be introducing you to the diamond bank mobile banking application. 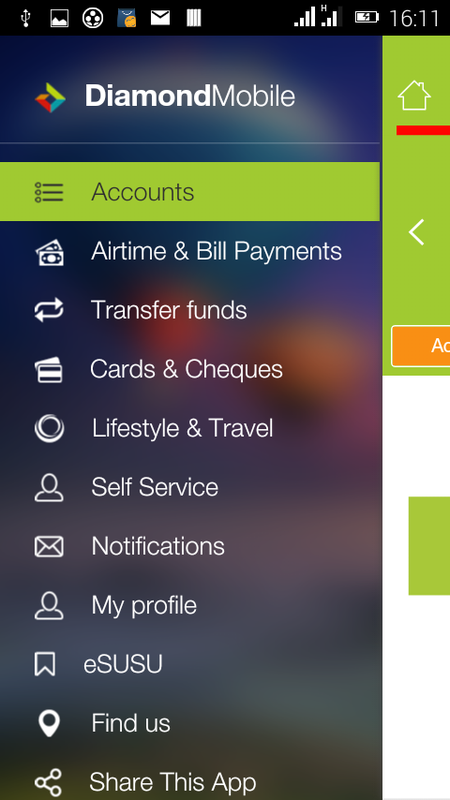 Believe me when I say these days you can not underestimate the power of mobile banking apps. They are always going to be there for you to make transactions easier. Ranging from the DSTV subscription to monthly utility bill payments and funds transfer (inter and intra banks). 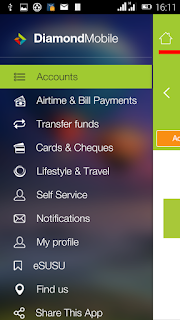 Now the Diamond bank mobile banking application has a lot of mouth watering features ranging from funds transfer, the diamond esusu, mobile airtime top-up, booking hotels and travel tickets.etc. Now let me tell you what I enjoy most on this application; funds transfer. Yes! In like few seconds you can wire that cash you owe a colleague at the office without any stress or hassles. Now, if you already have a diamond bank account, walk into any of the branches nearest to you and locate the customer service desk. The next thing is to tell the beautiful lady sitting right in front of you that you will like to sign up for the diamond bank mobile application service. They will issue you a form to fill, please fill appropriately and make no mistake. After you’ve done this submit and in less than two minutes a username will be generated for you, they will then ask you to create a password and pin. Yes! After the above process you are good to go and start enjoying seamless cash transactions online. 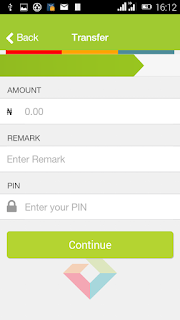 Let me just run you through how to make funds transfer using the diamond bank mobile application. 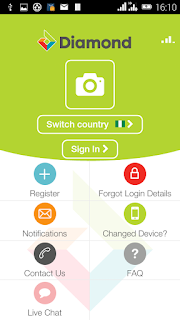 First step is for you to open the downloaded application, if not yet downloaded please get it from google playstore. Next, you need to sign in with your username and password. Please don’t mistake your pin for your password, they are both different. 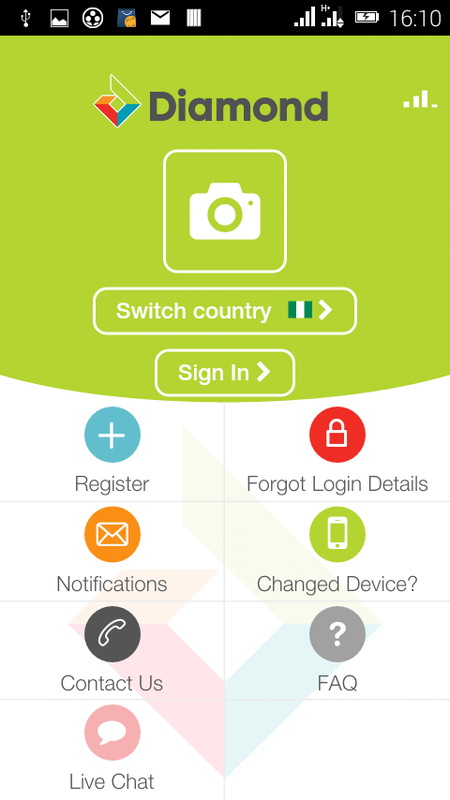 Next is for you to select other banks, after that the app will prompt you to select the account you are sending from. Next is for you to choose the bank you are sending to from the list of banks that will be displayed to you. Now, you are almost there, all you need to do after selecting the bank is type in the beneficiary’s account number. Next is for you to input the amount you wish to transfer and then your pin, the you click continue! The app will display the receiver’s details and all you need do is to confirm when you are sure it is the right destination. That is how easy it is! I hope you learnt something new today?